The Moxi shorts from Greenstyle Creations are one of my go-to summer patterns- they fit my #momlife perfectly, and give off a cool, athletic vibe even if I haven’t hit the gym all week. Once you know the pattern, they go together pretty quickly, but there are a few “tricky” parts that might trip up someone who’s unfamiliar with their construction. Someone like, you know, ME. Confession time: the first TWO times I made these during testing, I sewed them together WRONG. While this was exceedingly embarrassing, it was also a great learning experience. See how the back is SO SHORT here compared to the front? That’s a tell tale sign of incorrectly assembling the upper and lower back. I share this terrible photo for posterity- so you don’t follow in my footsteps. I also wasn’t too fond of bias tape before making these shorts- I’d used it in a few patterns, but nothing recent, and I was dreading all that ironing, folding and precise stitching. Well, after sewing up a bizillion versions during testing I made friends with bias tape, and I want to help you do the same. 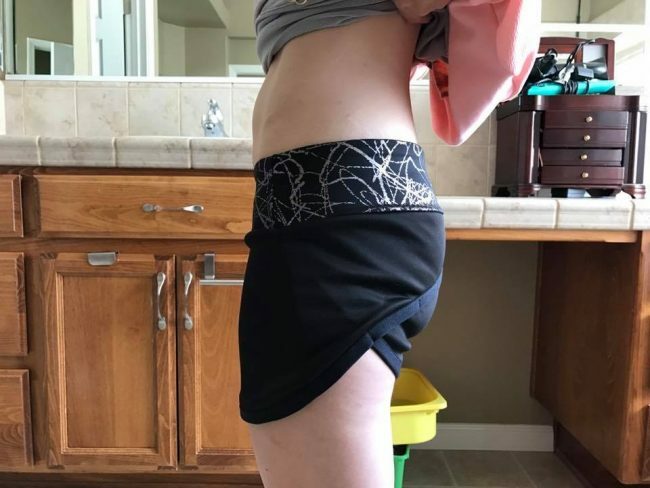 I’ll also show you how to properly attach the upper and lower back of the shorts so you don’t end up with the dreaded “underbutt” featured above (if you aren’t familiar with that term, I’ll let the urban dictionary do the work for me!). If you’re new to sewing with bias tape, I’ll give you a quick run-down. Bias tape is a folded binding made from strips of fabric cut on the bias, or the diagonal. When you cut a woven fabric on the diagonal, it has a fair amount of mechanical stretch, making bias tape perfect for finishing curved edges, like necklines, armholes, or hems, because it can stretch slightly to accommodate the curve. You can also cut knit fabric on the bias, and both knit and woven bias tapes tend to lay nicer than straight cut strips. Bias tape is created by ironing the bias strip in half, and then ironing the two edges in half again, to meet the fold. If you’re using double fold bias tape, like the Moxi shorts, you will be ironing it in half again, to enclose all edges. If you’re using single fold bias tape, like I did to finish the arm and neck edges of my Jalie Rova dress, you will just iron the two edges toward the middle. On my Rova Dress, the bias tape was not visible from the outside- on the Moxi shorts, the bias tape will wrap around the hem of the shorts and be visible on both the right and wrong side of the fabric. In the video below, I use the following tools to help me with my bias binding (aff links). My fabric is a stretch woven from the Fabric Fairy– I just love how lightweight it is for summer! But remember, as long as you choose your size correctly (sizing down for knits), the Moxi shorts are quite flexible and can be made in everything from stretch chiffon to yoga knit or athletic brushed poly. There are many ways of applying bias tape- in the video, I’m showing you the way that I am most comfortable with, that I believe is easiest for beginners. Side note: If you want to learn more about sewing with wovens, check out my blog tutorial on Wovens 101 HERE. Now I can hear all your inner lazy seamstress voices asking: Can’t I just buy bias tape at the store? Well, I’m as lazy as the next over-tired-mom, but I can tell you this is a terrible shortcut. Store bought bias tape is stiff, unforgiving, and, frankly, kind of ugly. You’ll be much happier with the effort you take to make your own- I promise! Ready to check out the video? Remember, I’m not sewing the shorts from start to finish here- just showing you the parts that include making and applying the bias tape and sewing the upper to the lower back, as these seem to generate the most confusion. Let me know if you have any other questions- I’m happy to help you sewn your own I-haven’t-exercised-in-ages-but-I-look-awesome-anyway shorts! And if you do manage to hit the track or the weights in your new pair- more power to ya! Don’t forget to check out all my other videos and tutorials HERE, and subscribe to my blog HERE so you don’t miss anything! Do you have any interest in a sewalong for these shorts? Let me know in the comments- if there’s enough interest I’ll get one scheduled! Thanks for the tutorial Sarah it clarified a lot for me. I hope you don’t mind but I have a couple of questions. Did you just use a plain stitch for these when you were sewing the bias tape on ie. not a stretch stitch? Does stretch woven fabric stretch vertically and horizontally? If I am working with a stretchier fabric can I still use that method for making the bias tape. And finally I love the top you were wearing in the tutorial. Would you mind sharing what pattern it was? You have inspired me to tackle a woven. Yes- I just used a straight stitch when attaching the bias tape. I did use a slightly longer stitch when topstitching it down- 3 mm. The stretch woven from Fabric Fairy that I used has 2 way stretch- so only side to side. Yes, this method will work for knits as well! I’m so glad this has helped you! I’m wearing the Datura Blouse by Deer and Doe Patterns. Find it here: https://shop.deer-and-doe.fr/en/sewing-patterns/15-datura-blouse-pattern.html It’s a really great one! Thanks for checking out my blog! Thanks taking the time to respond. Just a question about stretchier fabrics and binding. With the first pair I made I found it difficult to iron an crease into the fabric to make the binding. It wouldn’t ‘stay’ or ‘take’. It just kept popping back to straight. Do you think that spraying on starch and ironing would work? Yes- some knits are more difficult to iron. I’ve actually never tried spray starching a knit- but it should work! Sullivan’s spray and best press are my favorites- so you could try those. If that doesn’t work for you, I would use wondertape. Sew at where the first fold should be, then wrap your Binding around and wondertape it down at the right height so it won’t shift. Hope that helps! How would I use a knit fabric for the bias tape? I want to use the same fabric as my waistband which is a super stretchy supplex. Do I just cut it cross-grain instead of on the bias? Also this fabric doesn’t press all that well so any tips on applying and sewing it on to look decent would be helpful. 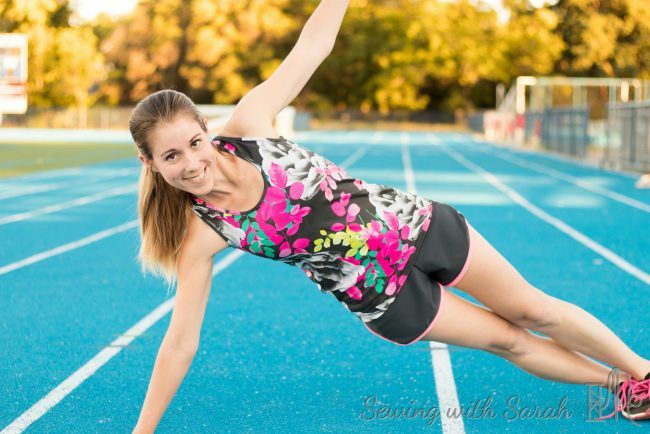 Love your blog and sew-alongs!! I cut my supplex/athletic brushed poly on the bias, even though it’s a knit. It worked well, though I think some testers just cut it in the direction of stretch too. Mine didn’t press well either in the Supplex- I would just mark the fold lines with a frixion pen or other disappearing marker instead.